Lists: Check them or chuck them? Some people swear by lists. Shopping lists help you remember what to buy. Bucket lists help you dream and scheme of places you’d like to go and things you’d like to do. Best seller lists help you ascertain what might be worth reading and are a boon to the writers whose books make it onto them. And checklists in hospitals and medical settings, especially those that remind doctors and nurses to wash their hands, save lives and minimize infections. And it’s handy to make lists before traveling, especially overseas, so one doesn’t arrive at the airport sans passport (mon dieu!). I’m a hiker. Hikers love lists. We have the Ten Essentials, items to carry on the trail. We have lists of places to hike. When I lived in Massachusetts and was a member of the Appalachian Mountain Club, we had a list of 4,000 Footers, 48 mountains that are at least 4,000 feet tall. Within the club there was such enthusiasm, if not obsession, around completing this list (in any order) that it was easy to come down with a case of 4,000 Footer-itis. One Saturday in December, a friend and I decided to climb Mt. Tecumseh (4,003′). As we drove to New Hampshire, clouds blotted out the sun. Rain and sleet pelted us on the trail. The snow on the ground turned to slippery mush. My friend asked if I wanted to head back. A sane person would have said yes, but I told him that since we had already spent a few hours in the car, and we were half way to the peak, we should finish it. Back then, the thought of turning around and having to try again was too much to bear. Maybe, because he didn’t want to appear to be the wimp, he kept going, too. At the top, thick fog enshrouded us. When we returned to the car, we were both sopping wet and shivering, despite our waterproof gear. At first I felt smug that I hadn’t let ugly weather interfere with my plans. Later I wondered if I had been a bit zealous. The mountain would have been there on a sunny day, too, maybe even offering a restorative view. As I continued to check peaks off the list, I kept hearing about people who, after completing the 4,000 Footers, stopped hiking. The list had become their focus, not the joy and challenge of being in the mountains, the very thing that brought them to the club in the first place. These “peak baggers” didn’t want revisit the trails they had enjoyed once before. As I finished more peaks, I noticed that hiking started to feel like a job. I couldn’t choose any hike if I still had specific mountains to climb, and once I had started to ascend I had to reach the top, even if I was exhausted, otherwise what was the point? The whole project felt contrived. I wondered if I had a genuine desire to check them all off the list or if I had succumbed to group think. After hiking 40 of the 48 (including several in subfreezing temperatures), I stopped looking to the list. I tried to ignore the voice in my head that told me I had given up and, therefore, failed. Here in Colorado, we have the Fourteeners, mountains higher than 14,000′; there are 53 ranked peaks. Some of these are technical climbs, requiring ropes, axes, crampons and considerable skill to safely ascend. Because of noon thunderstorms, climbers often begin at 4 a.m. to summit before lightning strikes. Some of my fellow Colorado Mountain Club members are working on this list, and I have enormous respect for their strength, endurance, ability to think clearly at high altitude and navigate off trail. Because these mountains are all over the state, and not all attempts succeed, it can take years to complete them. Yet, once spring hiking begins, people ask who’s planning to climb Fourteeners and how many. 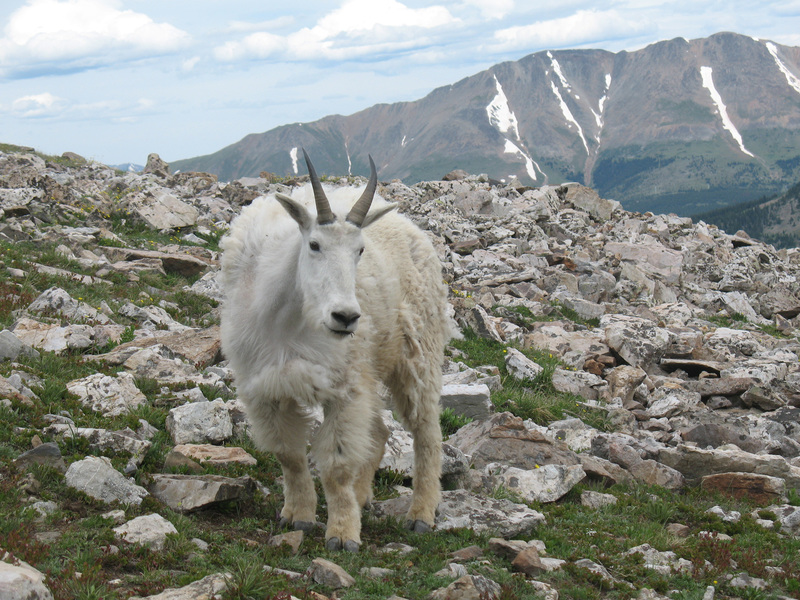 It’s as if only the Fourteeners count, not the myriad mountains and trails that reach 12,000′ or 13,000′, many with breathtaking views (but minus the crowds). I’m not averse to climbing the “easier” Fourteeners (I’ve done three) but instead of making them the focus, I’d rather commit to weekly adventures that challenge my body, nourish my spirit, and delight my senses. While I enjoy exploring new trails and regions, there is pleasure in returning to a place in a different season. In the intervening months, both I and the landscape have changed. It’s like getting reacquainted with an old friend and discovering something new about each other. It’s a subtle thrill that might be missed if one is too focused on a list or on reaching the top. « What if Every Moment were the Last Minute? Ilona, I appreciate your blog entries. They usually cause me to redefine, or at least think about, some aspect of my life. Thanks for another well-written thought-provoker. I like to think that whatever my situation or environment, I am involved in a leaving and a taking, that is, I shed some of my old skin and take on something new–a mutually active infusion of spiritual insight, if you will. I can’t make lists of those things. Good point about the spiritual infusions…it is hard to make a list of those, which is perhaps how it’s meant to be. Wonderful entry! Very well thought out and very well written. Makes one stop ….. and really think. Of course, I still have obsessive moments when I-must-reach-the-top-or-else! 😉 But, I no longer wish to always equate satisfaction with summiting. Very cool. I like that you were aware enough to question: was this a genuine desire or were you succumbing to group think…? I had a similar experience recently, where I had to stop and ask myself the same question, more or less. I’m so grateful to read your post…. almost like an affirmation. Glad my post showed up at a useful moment!